The Spanish Goat is sometimes known as the Brush Goat. They are descended from animals brought to America by early Spanish explorers. Spanish Goats are primarily wild animals, although as America’s desire for goat meat increases, so does the Spanish Goat’s popularity. Today, Spanish Goats are primarily found in the Southwestern United States. Because they are the result of selective breeding, Spanish Goats are capable of eating a smaller diet consisting of readily available plants. Selective breeding has also resulted in a small, agile animal that can navigate mountains filled with rocks, thorns and cactus with ease. Spanish Goats, when tame, are quite friendly. Because the Spanish Goat descended from a variety of different breeds that escaped or were set free by early explorers and settlers, they are not uniform in appearance. They range from 50 to 200 pounds in weight, although the smaller animals are more common because they are better able to navigate rough terrain. Spanish Goats also generally have small udders because larger udders are likely to be torn up on cacti and other plant life. They usually have horns, which are often quite large and twisted on bucks. They usually have long ears, similar to those of the Nubian Goat. The face is either straight or concave and they appear in a wide range of colors. 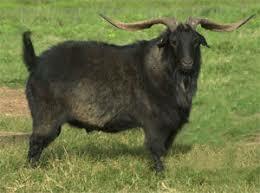 The first Spanish Goats were introduced to America in around 1540 by Spanish explorers such as De Soto and Coronado. These goats were very important to the early explorers and settlers because they were easy to move and were useful for milk, meat and hides. Using the goats for milk and meat reserved the hardier cattle for draft work. Various breeds of goats that either escaped or were set free became feral and interbred, resulting in today’s Spanish Goat. 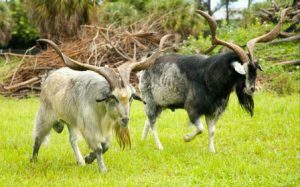 While goat meat is not particularly popular in the United States, with the influx of immigrants from different ethnic groups who highly value goat meat, the Spanish Goat is beginning to be propagated as a meat source. There are about 300,000 Spanish Goats in existence, with about 8,000 being “purebred.” They are not associated with any breed group and so conservation of the breed is difficult. Goat meat is lower in fat than beef. All meat goats should receive annual vaccinations for enterotoxaemia. They should also be vaccinated for tetanus. Meat goats are prone to internal parasites, which can be controlled by pasture management. They can also be treated with anti-parasitic drugs. Many handlers and breeders remove the horns from the goats while they are kids. The horns can cause injury to the goats because of fences and feeders, and can be harmful to humans. The horn buds are removed with a hot iron as soon as they are visible, however, many breeders choose to leave the horns on the goats. Goats generally breed between August and March. Female goats are in heat for about 21 days. Between 25 and 36 hours after the onset of heat, the female will ovulate. They are receptive to bucks for between 12 and 48 hours. The female will give birth to one, two, three or even four kids about five months after mating. The kids are usually born with the nose between the front legs, although breach births are common. The kids should be given plenty of colostrum or “first milk” within hours of being born to encourage the development of immunities. Kids are usually weaned at about three months of age.